JERUSALEM (CNN) -- The Israeli Air Force killed a Hamas militant who was part of a group launching rockets into Israel on Wednesday, Israeli officials said. 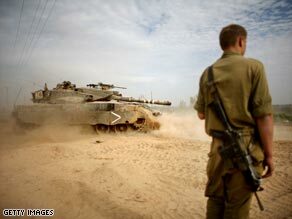 An Israeli tank maneuvers during a deployment near the Israeli border with Gaza. Israeli military officials said Hamas militants fired more than 65 rockets into southern Israel on Wednesday -- four days after a cease-fire officially ended. The Israeli attack came as Hamas stepped up its attacks on civilian targets. The Israel Defense Forces said at least two air force helicopters took part in an operation in southern Israel, which targeted a group launching mortars. The squad was responsible for launching at least six mortars toward Kerem Shalom, the crossing point between Israel and Egypt, the IDF said. The military wing of Hamas said one of its members was killed and three others were wounded when Israel targeted the site of a shelling operation. Hamas sources also said two members of its military wing were killed Wednesday morning during a "work-related accident," while on a jihad mission. An Israeli police spokesman said no one had been injured in the latest barrage of rocket attacks by Hamas into Israel. But emergency workers with Magen David Adom, Israel's Red Cross agency, treated 57 people suffering from shock, half of them children, an MDA official said, adding that 200 ambulances were standing by in the area. "I think the circumstances are extremely tragic, that Muslim zealots of Hamas have decided to shatter and ruin the Christmas celebrations of the Christian brothers in the Holy Land, both in the West Bank and of course in Gaza itself," Israeli Welfare Minister Isaac Herzog said. Although the sites visited by many Christians are not in southern Israel, the growing violence triggered a new wave of security concerns across the country. "If things deteriorate further, then of course we'll have to take necessary action, which will be very painful," Herzog said, adding that civilians had gathered in shelters in southern Israel to try to stay safe amid the rocket attacks. Asked about the possibility of Israel coming up with a new strategy, Herzog responded, "The new strategy could be, of course, an all-out conflict against Hamas, which is a possibility that voices in Israel are calling for. We are trying to show restraint." Earlier Wednesday Palestinian militants had fired more than 30 rockets and mortars from Gaza into Israel days after Israeli Prime Minister Ehud Olmert threatened to respond to the ongoing attacks. Izzedine Al Qassam, the military wing of Hamas, announced in a statement on its Web site it had fired four rockets in revenge for what it called the "assassination" of five of its members by the Israeli military. One of the rockets landed in an industrial section of Ashkelon, north of Gaza, while other rockets struck a house in Kibbutz Kfar Aza and landed near the town of Netivot. An Israeli police spokesman said no one was injured in the rocket barrage. The Israel Defense Forces said after the firing of rockets, crossings from Israel into Gaza will remain closed Wednesday, and humanitarian aid that was supposed to enter Gaza will not. Sources with the military wing of Hamas said the group fired a number of mortars into Israel from an area east of Khan Younes in southern Gaza. A tenuous six-month truce between the Hamas government in Gaza and Israel expired on December 19. Under the Egyptian-brokered deal, Hamas agreed to end militant attacks on Israel from Gaza, and Israel agreed to halt raids inside the territory and ease its blockade on humanitarian goods. In reality, the truce had started breaking down in October. Rocket attacks by militants became more frequent, and Israel resumed airstrikes inside Gaza. On Sunday, Olmert said Israel will "take the necessary measures" to respond to the rocket attacks from Gaza. "Israel will know when to respond correctly and with the necessary responsibility," Olmert said at the beginning of his weekly Cabinet meeting. He said he would "not go into detail" about what actions Israel would take, but insisted the country had formulated various plans to respond to different contingencies. "A responsible government is neither eager for battle, nor does it shy away from it," Olmert said. CNN's Michal Zippori contributed to this story.